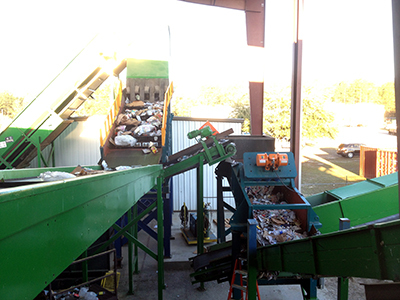 Tallahassee, Florida-based Marpan Recycling opened a Class III recycling facility in 2008. When selecting a new screen, the firm chose a General Kinematics (GK) FINGER-SCREEN™ Primary Screen—a tried and true choice for separating construction and demolition (C&D) debris into overs and unders fractions. Three years later, when Marpan was building a facility to process single-stream recyclables, President Kim Williams decided to break from tradition and go with the screens he knew could get the job done. He says system suppliers for single-stream recycling were all using a disc screen, and it had several disadvantages. Plastic bags wrap on the discs leading to shutdowns for workers to climb on to the screen and cut the plastic bags loose. "I just thought I didn’t want that kind of screen," Williams recalls. Williams says he worked with GK to develop a different approach for the first phase processing in his single-stream plant. "GK replaced fingers on a traditional FINGER-SCREEN™ with a rod-deck. The ROD DECK SCREEN allows more space for smaller material to fall through compared to the fingers, now set at six inches or less." "The rods gave us the flexibility to remove or add rods to modify the spacing," he says. When the facility opened in January 2013, Williams continued modifying the spacing and speed to get the material cut just right. Today, he says, "It does a great job. It does what I want it to do, and you can actually clean it while it is running." Unlike disc screens, material doesn’t wrap. Instead, it falls or shakes through. If something does get caught, Williams says it doesn’t wrap, so it is easy to remove. "It’s a much better solution and a lot less maintenance than a disc screen," he says. In addition to the primary ROD DECK SCREEN, the single-stream MRF also includes LONG STROKE FINGER DECK that separates glass from contamination. Developing the high throw or long stroke design required considerable engineering from GK to substantially increase the deck’s throw. According to Williams, the higher throw adds more flow and moves material through at faster rates. "We keep finding ways to improve the quality of our outputs and the speed at which we process," notes Williams. "GK builds such robust equipment that works so well," he says. "We’d run a test on the single-stream material on the primary screen we had at our C&D plant. We could see that it might work, but would require some modifications. GK came back with solutions that have worked very well." The success of the nontraditional equipment usage at Marpan has become an example for others. The company has opened its doors to GK’s customers to allow them to see the innovative ways it is using these screens to increase material quality and lower operating costs. The facility takes in between 1,500 to 2,000 tons of materials per month and processes about 12 tons of recyclables per hour. When materials enter the system, they first drop into a hopper with a moving floor. The material is then fed onto an incline belt where it’s metered by the steepness of the conveyor and its five-inch tall paddles. The speed of the belt can be adjusted depending upon the moisture or density of the materials. The materials then fall seven feet onto the ROD DECK SCREEN. The fall breaks the glass when it lands. The screen then separates materials into large and small fractions. Polyethylene terephthalate (PET) bottles, glass and other "unders" fall through, while larger materials stay on top. 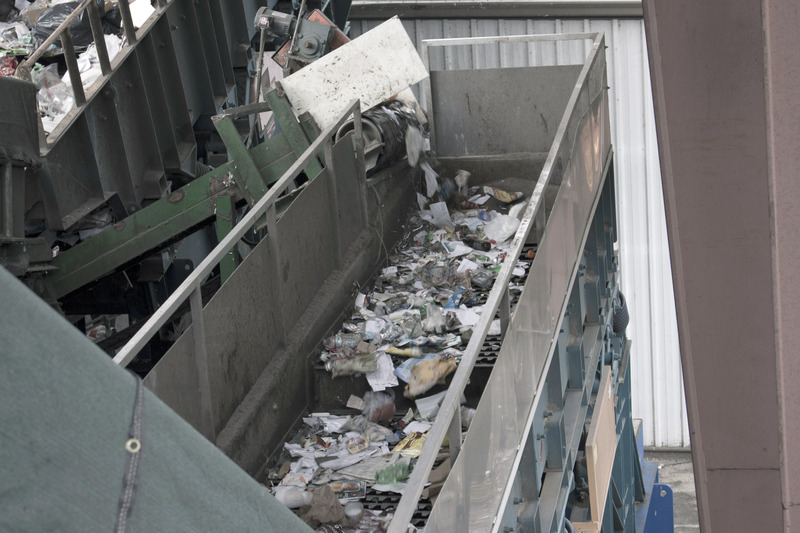 Workers break the bags open, leaving the mixed paper on the top, while the containers from the bags are placed on a belt and run back through the system. The unders are then transferred past an over-band magnet into the secondary screen, the GK long stroke FINGER-SCREEN™. The longer stroke of this screen helps to move the lighter fraction more effectively for a faster rate of travel, improving separation of the glass fraction from the fiber. The majority of glass is removed at this stage, allowing the ballistic separator to operate more effectively. The fiber and containers then go to a ballistic separator. Three-dimensional materials roll to the bottom and onto the discharge belt, while the 2-D materials climb up and over the top. All of the two-inch-minus material passes through the deck. The 3-D material heads to a magnet that pulls out the metal cans while plastics are hand sorted into natural and colored high-density polyethylene (HDPE) and Nos. 3-7 plastics. An eddy current separator at the tail end of the process pulls out aluminum cans. The screens from GK are critical to the entire system, and Williams has been pleased with the results. "Their equipment is very reliable," he says. While reliability is important, that is not the only reason Williams works with GK. It’s also because of the company’s willingness to help Marpan solve problems. "GK engineers have broad experience across many industries. By virtue of that, they can bring solutions to the table that others won’t." "We’ve had a long relationship," continues Williams. "I think the world of their people. They know what they are doing. Not everybody puts the type of quality into their products that GK does. Their stuff just works every day." Marpan is continuing to improve upon its processes. Upcoming plans include using a FINGER-SCREEN™ Primary Screen in its new line to further clean out glass. Williams says by further refining the process, a cleaner end product will be produced. "We know what customers want and we are working toward that end," says Williams. General Kinematics offers a new way to think about single-stream processing, one that increases quality and lowers operating costs through the implementation of superior screening solutions. "GK makes a fantastic product. Whatever they do, they do it over the top with the quality they put into it," says Williams. "GK makes a fantastic product. Whatever they do, they do it over the top with the quality they put into it."